Ottrélite: Mineral information, data and localities. 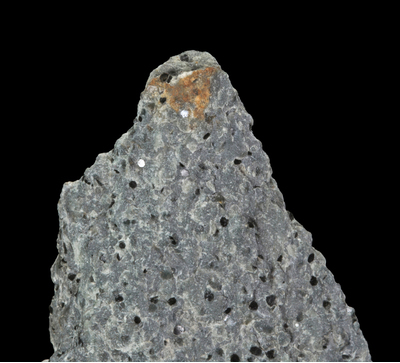 Named by A. Descloizeaux and A.A. Damour in 1842 for the type locality of Ottré, Belgium. Mn analogue of chloritoid. 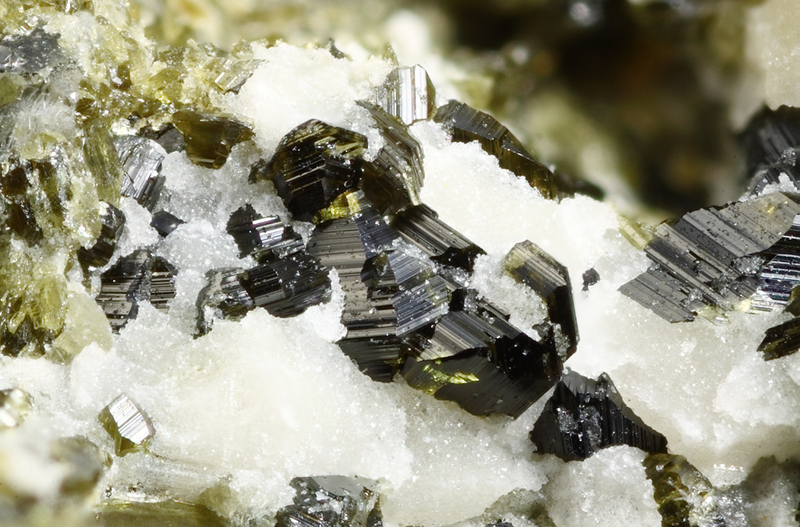 Ottrélite was originally described as a Mn-rich, but not necessarily Mn-dominant chloritoid, consequently many "ottrélites" are in reality Mn-rich chloritoids, see Chloritoid best minerals article and references therein for further details. Typically occurs in low- and medium-grade metamorphic rocks. Monoclinic and triclinic polytypes are known. Space group Cc or C2/c. Pseudohexagonal. Quartz 1 photo of Ottrélite associated with Quartz on mindat.org. Malachite 1 photo of Ottrélite associated with Malachite on mindat.org. 16.16.9 Ganophyllite (K,Na,Ca)2Mn8(Si,Al)12(O,OH)32 · 8H2O Mon. 16.16.14 Eggletonite (Na,K,Ca)2(Mn,Fe)8(Si,Al)12O29(OH)7 · 11H2O Mon. 16.16.23 Okhotskite Ca2(Mn,Mg)(Mn3+,Al,Fe3+)2(Si2O7)(SiO4)(OH)2 · H2O Mon. 16.16.24 Pumpellyite-(Mn2+) Ca2Mn2+Al2(Si2O7)(SiO4)(OH)2 · H2O Mon. Descloizeaux, A., Damour A.A. (1842) De l'ottrélite. Nouvelle espèce minérale. Annales des Mines: 2: 357-361. Hutchings, W.M. (1889) On the Occurrence of Ottrelite in the Phyllites of North Cornwall. 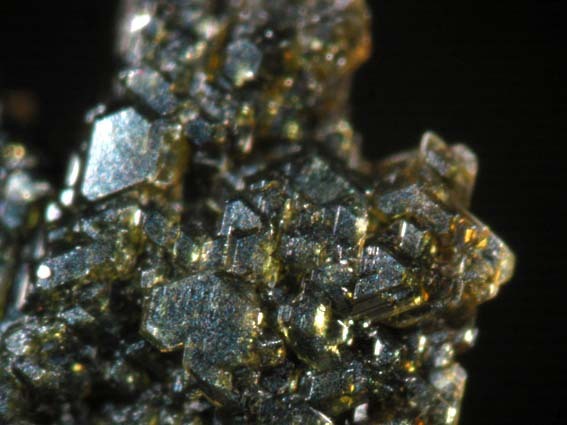 Geological Magazine (Decade III): 6(5): 214-220. Spencer, L.J. (1898) Supplementary list of British minerals. Mineralogical Abstracts: 30: 285. Halferdahl, L.B. (1961) Chloritoid: its composition, X-ray and optical properties, stability and occurrences. Journal of Petrology: 2: 49-135. Fransolet, A.-M. (1978) Données nouvelles sur l'ottrélite d'Ottré, Belgique. Bulletin de la Société française de Minéralogie et de Cristallographie: 101: 548-557. Theye, T., Fransolet, A.-M. (1994) Virtually pure ottrelite from the region of Ottré, Belgium. European journal of mineralogy: 6(4): 547-555. Fransolet, A.-M., Theye, T. (1997) On the Ardennes chloritoids and the ottrelite term (Cambrian, Belgium-French): A comment. 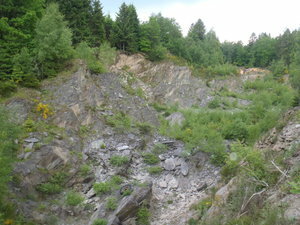 Neues Jahrbuch fur Mineralogie Monatshefte: 328-331.
ⓘ Sur les Roches quarry ? Sabina, A.P. (2003): Rocks & Minerals for the collector; Kirkland Lake - Rouyn-Noranda - Val d'Or, Ontario & Quebec. GSC Misc. Report 77, 92p. Lis, J., Sylwestrzak, H., 1986. Minerały Dolnego Śląska. Instytut Geologiczny, Wydawnictwa Geologiczne, Warszawa, 791 pp. Rastall, R.H. (1910) The Skiddaw granite and its metamorphism. Quarterly Journal of the Geological Society of London, 66, 116-141.; Cooper, M.P. and Stanley, C.J. (1990) Minerals of the English Lake District: Caldbeck Fells. Natural History Museum Publications, London, 160 pp. (referring to Rastall, 1910). Murphy, Franklin Mac (1932), Geology of a part of the Panamint Range, California Calif. Min Bureau Report 28: 347; Murdoch, Joseph & Robert W. Webb (1966), Minerals of California, Centennial Volume (1866-1966): California Division Mines & Geology Bulletin 189: 137; Pemberton, H. Earl (1983), Minerals of California; Van Nostrand Reinholt Press: 436. Murdoch, Joseph & Robert W. Webb (1966), Minerals of California, Centennial Volume (1866-1966): California Division Mines & Geology Bulletin 189: 137. Rocks & Min. : 60: 92.
ⓘ Jamestown Graphite mine ? Roberts, Willard Lincoln, and George Rapp, Jr. (1965), Mineralogy of the Black Hills, South Dakota School of Mines and Technology Bulletin 18.